The Xperia Z2 Tablet looks exactly like the Tablet Z – it is based on the OmniBalance design philosophy, which was introduced a year ago by the Xperia Z smartphone. It’s a really sleek design that scales impressively well to tablet size. The new Z2 Tablet is powered by the Snapdragon 800 chipset with a 2.3GHz quad-core Krait 400 processor, Adreno 330 GPU and 3GB of RAM. It comes with an 8MP cam over its back and a 2MP front snapper for video chats. As usual, the slate will be available in two flavors – Wi-Fi only model and an LTE-capable one. It seems both versions will be offered with 16GB internal storage, expandable via a microSD slot. Even though the Xperia Z2 Tablet is a significant update over its predecessor, it does not look like such. Yes, the Android 4.4 KitKat is lightning-fast, but it the changes are only under the hood, on the surface it looks just like before. And if it wasn’t for the few different icons and premium apps (such as the OfficePro Suite), we wouldn’t even know we are handling the new Z2 Tablet. Still, the slate is a real pleasure to handle with very nice soft touch at the back. We’ve always thought the Tablet Z as one of the best looking tablets on the market and a year later we can still say the same thing about its similar-looking sibling. The upgrade might not be a major one, but it is still a worthy one. The Tablet Z users will be getting all the same software enchantments with the upcoming KitKat update and we guess they could easily stick for at least another year with their gadget. 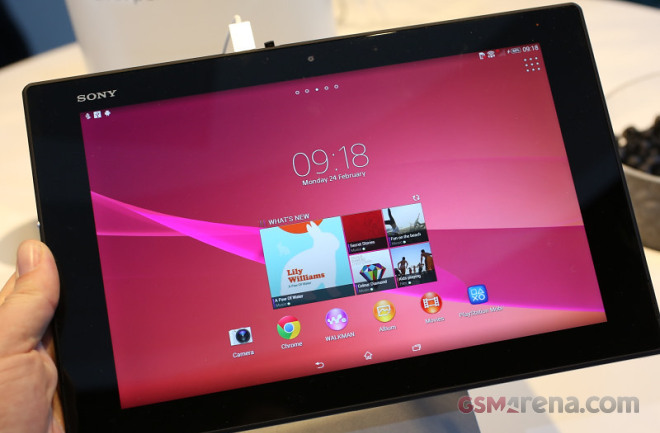 But the Xperia Z2 Tablet will be a very easy purchase for all newcomers.